Opti-Lube is the ultimate in performance diesel fuel additives, dedicated to protecting your equipment by providing exceptional lubrication in the fuel system. Summer+ Cetane is our best diesel fuel additive for warm weather and your wallet. "Why do I want higher cetane in my diesel fuel? ", you ask - By increasing the cetane number of your fuel you improve cold starts and reduce engine noise. By reducing the ignition delay cetane causes a more complete burn, this commonly results in increased MPG. Generally, diesel engines operate well with a CN from 40 to 55. As mentioned earlier, fuels with a higher cetane number have shorter ignition delays, providing more time for the fuel combustion process to be completed. Hence, higher speed diesel engines operate more effectively with higher CN fuels. Boosts Cetane by 5-7 points and Enhanced Lubricity for Reduced Fuel System Wear. 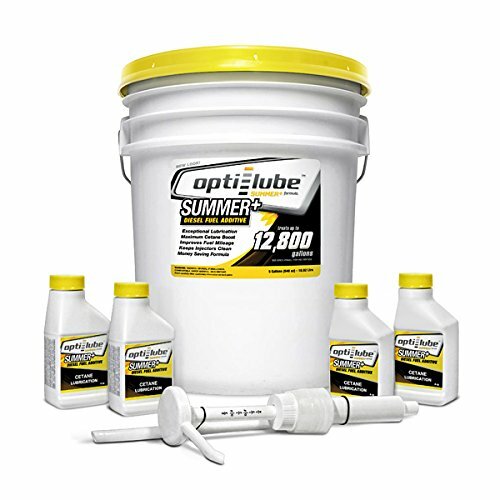 If you have any questions about this product by Opti-Lube, contact us by completing and submitting the form below. If you are looking for a specif part number, please include it with your message.